Portland, OR (February 8, 2019) –The United States Association of Cider Makers (USACM) elects a new slate of directors and officers each year during its annual meeting which takes place during CiderCon – the industry conference for USACM members held each February. CiderCon 2019 took place at the Hilton Chicago from February 5 to February 8. At CiderCon this week, USACM welcomed new leaders, reelected others and thanked those retiring their service for all they have done to support a growing cider industry. Paul Vander Heide of Vander Mill Cider in Grand Rapids, Michigan, has been reelected to the office of President by the USACM Board of Directors. Paul has served on the USACM board since February 2016. During that time, he has been committee chair for USACM’s Certified Cider Professional program, a cider credentials program similar to Cicerone for beer. Paul had previously served as USACM Secretary and Vice President before being elected USACM’s President. 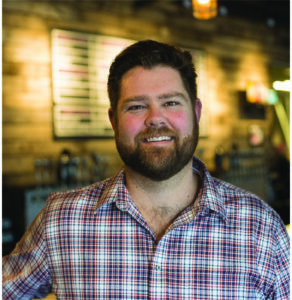 Vander Heide also sits on the boards of the Michigan Cider Association and the Cider Institute of North America. Brooke Glover of Swilled Dog Hard Cider in Franklin, West Virginia, was elected as USACM’s Vice President. Brooke joined the USACM Board in 2018 and will continue to serve as a Member At Large. Ben Calvi of Vermont Hard Cider Company in Middlebury, Vermont returns for a second term on the board and was reelected as Treasurer by the 2019 USACM Board of Directors. Eric Foster of Stem Ciders in Lafeyette, Colorado, serving the third year of his first term, was reelected by the board to continue as the Secretary of USACM. OTHER DIRECTORS: In addition to its Officers, the USACM Board consists of Regional Chairs, Members At Large and three Large Cidery Seats. Eleanor Leger, Eden Specialty Ciders of Vermont and David C. Thorton from James Creek Cider House of North Carolina have been elected to represent Eastern and Southern cideries respectively. Leger returns for her second term after a one-year hiatus. “I would like to support and promote the work of regional associations, and will work to build a strong and vibrant cider community in the Northeast,” says Leger. Dan Young of Tandem Cider in Michigan representing the Midwest. In addition to their board officer duties, Paul Vander Heide has been reelected as an At Large Member, and USACM Treasurer Ben Calvi has been elected a Large Cidery board member. Other At Large board members include Brooke Glover of Swilled Dog Hard Cider and Sam Fitz of ANXO Cider in Washington DC. Additional Large Cidery board members include Brian Shanks of Bold Rock Cider in Virginia and Ryan Burk of Angry Orchard in New York. MISSION: The USACM is an organization of cider and perry producers in the United States. Its mission is to grow a diverse and successful U.S. cider industry by providing valuable information, resources and services to USACM members and by advocating on their behalf.